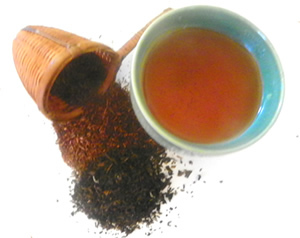 Rooibos and green tea - this colorful green and red tea combination is chock full of tasty antioxidants. Makes a great mid morning or afternoon pick-me-up. Use a pinch of stevia instead of the honey if you are watching your weight. This tea will help burn calories.